The 14th State Legislature convened with steadily sliding oil prices and an enormous amount of State-sponsored debt from years of big spending. In addition to fiscal distress, campaign law violations and questionable ethics were attracting public scrutiny. When reporters with the Anchorage Daily News used computers to track campaign contributions in 1985, they uncovered widespread evidence of serious irregularities in both local and state political campaigns. Meeting in a 30-day special session to consider the possible impeachment of Governor Sheffield, Legislators opted instead to study and then revise procurement practices and procedures. Meanwhile, Federal agencies were investigating Alaska's first full scale white-collar corruption case, a case involving more than a dozen individuals working in or doing business with the North Slope Borough. Legislators talked of capping the North Slope Borough's bonding authority lest the State get stuck with its escalating debt; they tightened eligibility for the Longevity Bonus Program so that an absence from the state for more than 90 days would render a recipient ineligible for 12 months; and they considered wholesale campaign finance reform, including a proposal to eliminate the $1,000 ceiling on campaign contributions, based on the idea that those with money could find loopholes to exceed the limit, but if there were no limit, the public would know who provided the funds. With Federal authorities threatening to take over management of hunting and fishing resources on public lands, lawmakers in 1986 enacted a new definition of "rural"-a solution to the subsistence issue that would not last long. When oil prices dropped below $10 per barrel in 1986, the budget was in free fall. Governor Sheffield ordered instant salary cuts of 15 percent for commissioners and other top nonunion officials and proposed a 10 percent cut in the salaries of all state workers. With the unions opposed to that idea, the Legislature instead created a retirement incentive program (RIP) for teachers and public employees and created Tier II of the public employee retirement system, increasing by five years the retirement age and reducing cost of living increases and medical benefits, among other changes. Lawmakers also rejected reinstatement of an income tax and a proposal to use Permanent Fund earnings if oil revenue fell short of the $2 billion spending level, as well as the "403030 Plan," which would have put before voters in 1987 a proposal to set aside 40 percent of Fund earnings for dividends and 30 percent each for inflation proofing and general government use. Among other issues addressed, the 14th Legislature passed its third resident hire bill, this time calling for a local resident preference on public works projects under certain conditions, and they established policy reasons for a bidding preference for Alaska businesses in state contracts. Lawmakers also passed the Alaska's first major tort reform measure to limit civil liability, created the Railbelt Energy Fund, financed the Delong Mountain Transportation project, set aside $50,000 for importing elk to Southeast Alaska, provided disaster relief for flood damages, provided for the introduction of Duck Stamps, and established a state "superfund" to pay for containment and cleanup of oil and hazardous substance releases. 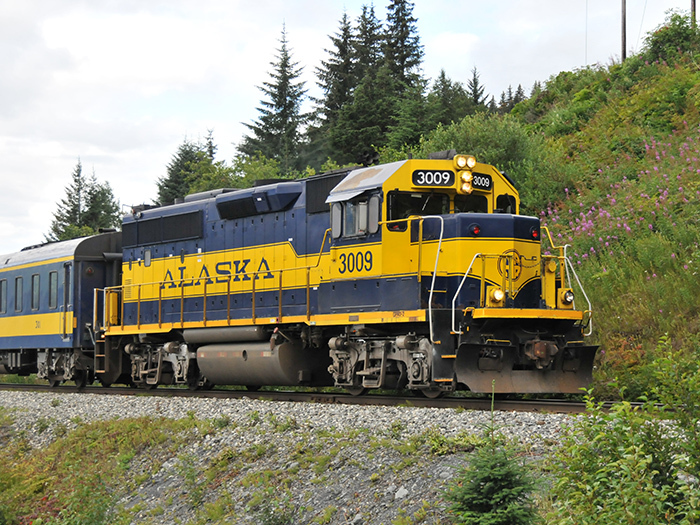 Ownership of the Alaska Railroad transfers from the Federal government to the State. Libby Riddles becomes the first woman to win the Iditarod. The 5 billionth barrel of oil arrives in Valdez. Construction of Spring Creek Correctional Center begins. With 1 computer for every 22 students, Alaska leads the nation in making computers available in schools. 1985 publication of Open Secrets brings Alaska politics to national attention when Time Magazine takes note of the early use of computers in reporting by the Anchorage Daily News.